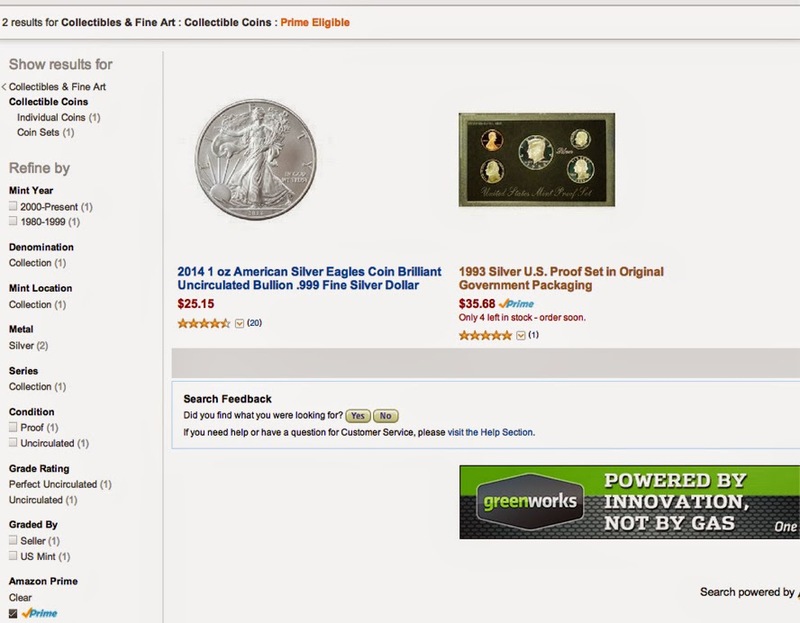 Yesterday, Amazon unveiled its Collectible Coins section. This is very different from eBay. First, not just anyone can sell here. Right now, it seems to be only about 100 dealers or less who have been approved. The sellers include mostly easily recognizable names. Of 10,720 offerings at the time I visited, almost 60% were over $200.00 and when I searched for $1,000 or over, 3,479 coins were listed. A similar search on eBay yielded 134,539 "Buy it now" offers, with less than 4% over $1,000.00. Note that unlike eBay, sellers are allowed to state a grade for unauthenticated coins. I was amused to note that one of the things you can search by is Amazon Prime (a fee based program for buyers that offers free shipping on some merchandise). They didn't have much. "No mint mark"? Yes, 1795 U.S. dollars have no mintmark. "Collectible - Like new" for an MS10? Obviously the sellers get forced into a matrix that hasn't yet been tuned for coins. But the more important question here is how this affects eBay. Some seem to think that Amazon's entry into coins is a harbinger of doom for eBay, but I can't see that. 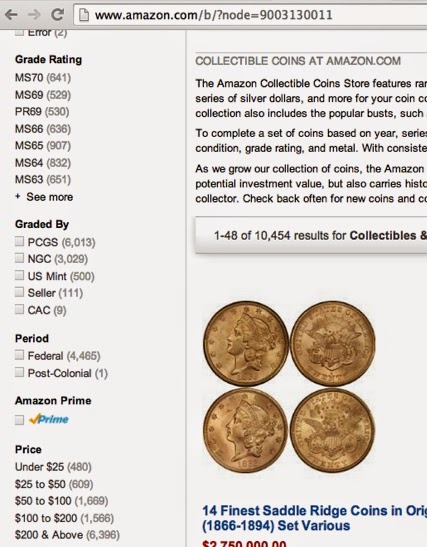 First, although Amazon's selling machine is powerful, glitches like the "1795 No Mint Mark Silver Dollar, Collectible - Like New" are amateurish and from what I know of Amazon, they won't rush to fix that and instead will expect dealers to put up with it. Having no auctions is even more important. Amazon tried auctions in 1999 and failed miserably. I doubt they'd try it again, but if they do, my bet is that they would fail again. The competition is too entrenched and although sellers complain about fees, eBay is very good at this. Speaking of selling fees, Amazon has a different structure, but from what I can see, it all works out about the same: sellers are not going to flock to Amazon to save money. That 134,000 offers vs. less than 11,000 is also telling - there's not much there. That could change, of course, but I'm not sure that it will. I just don't see a mass exodus of eBay sellers moving to Amazon. I looked at Amazon also. Not liking it so much right now.